My team and I completed Neil’s two-day compelling presentation course. Fantastic course with simple techniques you can take away and also great real-life examples from great speakers. Highly recommend to individuals and teams. Neil broke down the art and science of persuasion, influence and presenting and provided a series of frameworks for organising presentations in a hands-on course. His approach is very personalised and I came away with a better understanding of public speaking and myself. PHD recently commissioned Neil to run a Building Better Relationships Training for some of our senior leadership. I’ve been to quite a few of these courses, run by various people in various countries, but can say with certainty that this was one of the better ones out there. Neil’s experience both agency and client side provided invaluable and interesting anecdotes and each of the lessons was insightful and fun. Would be happy to recommend him to any company or organisation looking to up-skill their management or teams in the crucial art of business relationship building. A very worthwhile course. Great content delivered well. I thoroughly enjoyed it and that’s coming from a training course cynic. I attended Neil’s Speaking Inspirationally and found it one of, if not THE, best courses I have ever attended. Neil’s enthusiasm, expertise, and edification make this a ‘must attend’ course. And unlike most courses, the application of what you learn can be applied daily. He is a consummate professional, and a great guy to boot (as you would expect from someone who won the Macquarie University Open Joke Telling Competition – two years running!). I continue to use Neil as a sounding board, and his ‘tweaks’ always improve whatever I am writing. Thank you, Neil, for all your contributions! Along with a number of senior managers from OMD, I attended Neil’s workshop Speaking Inspirationally in June 2012. There are plenty of workshops around presentation skills, poise, structure, etc. but Neil’s workshop focusses on the language to engage and persuade which is essential for any communications or business practitioner. Far too many presentations rely on PowerPoint and far too much content. Get the words and tone right and you can do without this crutch. 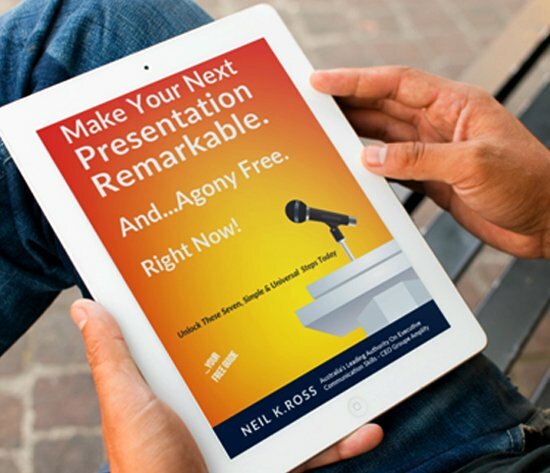 Neil goes back to the basics of engaging your audience to get them nodding and understanding your message. It’s one of the best workshops I have attended for a very long time and I highly recommend it. I have been involved in a few of Neil’s executive training sessions. In short, they are clear, well managed and most of all, highly effective at transferring some usable techniques that you can take back to work the very next day. Neil is a very good listener and works with your own personality and business context to help you become a more effective communicator. He is not a one-size- fits-all operator, and that is Neil’s key difference. Neil Ross put on the best course I have attended all year. His teaching and support has turned me from someone frightened of public speaking to someone who is actually looking forward to the next event. I’d rate Neil 10/10. Neil is a great communicator, orator and linguist and I thoroughly enjoy our sessions and would happily recommend Neil to other companies.